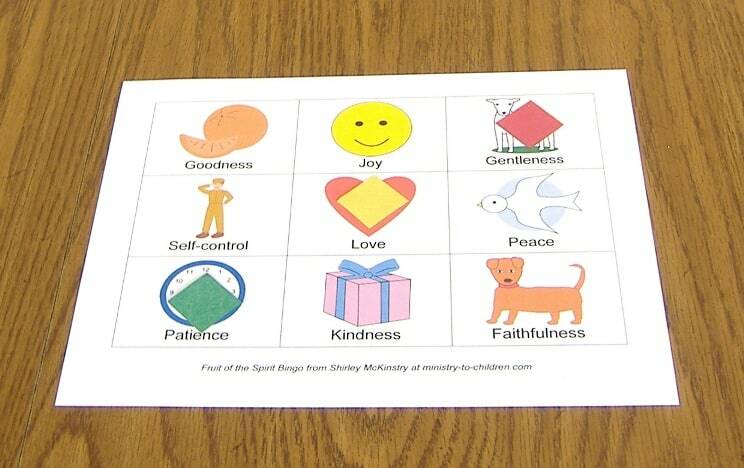 Download this printable BINGO style game to help children review and talk about the Fruit of the Spirit. We would love to hear your feedback and creative ideas, simply leave a comment below. 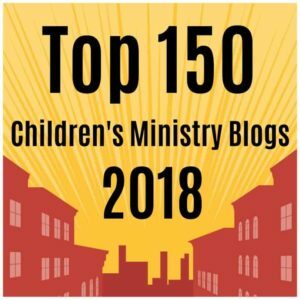 God wants to produce the Fruit of the Spirit in children’s lives. 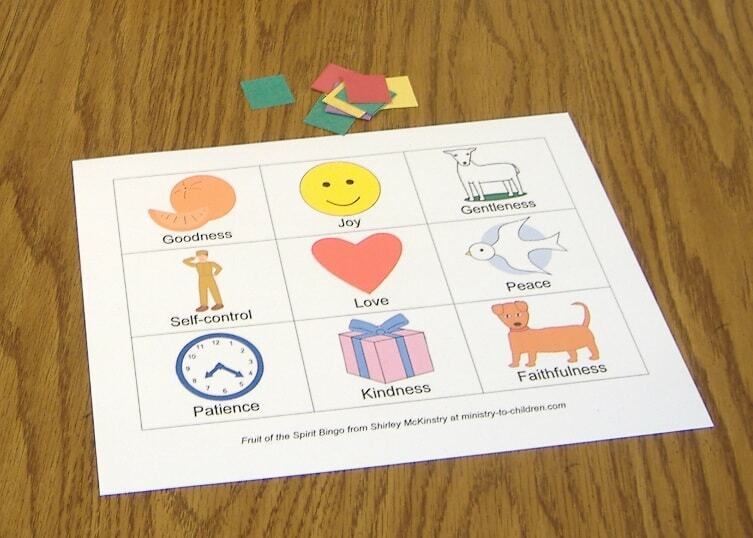 This game helps them become familiar with the qualities that are listed in Galatians 5:22-23. It would be suitable for any lesson about the Fruit of the Spirit. Print the bingo cards and the bingo calling cards on card stock or heavy paper, and cut apart the calling cards (20 bingo cards and 9 calling cards are attached). Cut colored paper or cardboard into 1-inch squares to make markers (or choose to use other markers). Each player with a square matching the calling card places a marker on that square. Dump the markers and start over. Players can trade cards if they wish. Prizes are not necessary; kids love learning and playing games just for the fun of it. Give each player a bingo card and a handful of markers. 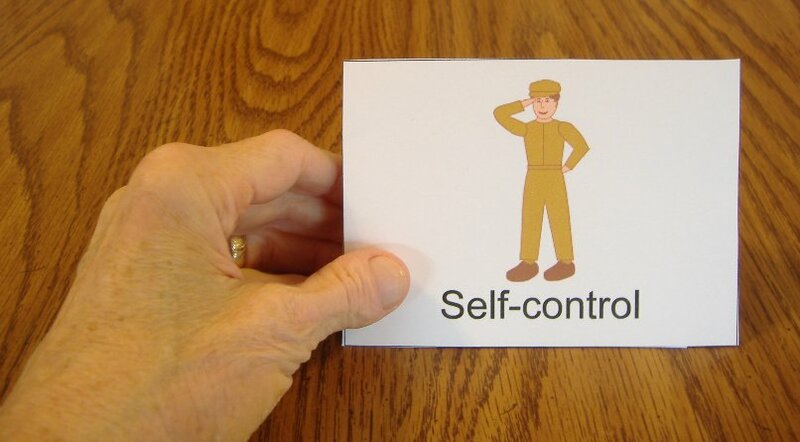 The leader draws a calling card, reads the title, and holds the card up for everyone to see. The first person to get three markers in a row horizontally, vertically, or diagonally wins the game. This game is excellent. I use it for both Sunday school teaching and the children love it. The colours are very bright and colourful and I think it holds their focus to the pictures and the words. This help to let them know it is not a fruit that we eat but the way we live our lives showing our inner qualities from our hearts as Christians.Some even learn to read the words from the cards. I must mention too that even the kindergarten children learn a lot from it too – counting, language arts – reading, phonics (beginning sounds) spell, and being creative with what the picture is depicting. This stuff is really great. I love it. Thank ou so much for this craft. May God bless you always. This is a great idea for very young children. For my older kids from 1st – 4th I will read various definitions are situations and they have to decide which fruit to mark. I also use coke bottle tops as markers because I get tired of cutting up paper. Your bingo board saved me lots of time and I love the pictures. I continue to find many wonderful ideas and lessons on this web sites. It’s one of my go-to sites every week when I teach Sunday School and Team Kids on Wednesdays. Thank you. Thank you for this resource!!! Thanks for this creative ideas! Tony Kummer (Editor) reviewed & updated this page on : October 3, 2012 at 11:20 am. All our content is peer reviewed by our readers, simply leave a comment on any post suggest an update.